Kelly Haigh “9PM”, 24×24, acrylic on canvas, at the “Summertime Show” at El Kartel in Vancouver. Kelly Haigh lives, paints, and cuts hair in Vancouver, where she also sings and plays in the band, Ashley Park. She is currently obsessed with Victorian Taxidermy, and plans on turning her tiny hair salon into her own private natural history museum. 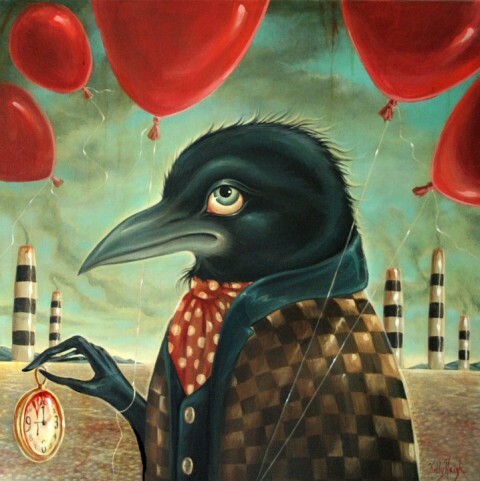 There is a story on Kelly’s website, which speaks of her stuffed crow, whom she’s named Jack T. Crow, and how he takes her on his back to some magical, yet sometimes terrifying places, and how he has her paint all the scenes they witness together in that surreal landscape of dreams. Kelly Haigh has created an album of surreal dreamscapes and opens the gates to a universe you exist in momentary somewhere between consciousness and dreams as you are drifting away to sleep. “Country Western Star” is an auditory equivalent of her paintings and encompasses numerous elements of pop and surrealism, cuteness, terror, beauty and fear, in a cloud covered atmosphere with stories rooted on this planet but somehow not of this earth. “Country Western Star starring Kelly Haigh with Frances the singing dog” is a package to behold; from Kelly’s art which adorns the cover, the eight-panel fold-out insert, the six-panel fold-out CD jacket and the music itself featuring 25 surreal musical stories.